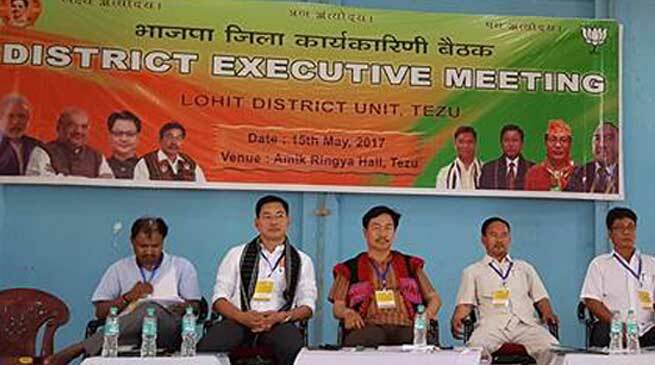 The executive body of Lohit district unit of Bharatiya Janata Party was conducted at Tezu on May 15, wherein several Congress Panchayat leaders formally joined the party. Prominent among the PRI leaders, who joined the party, included Lohit ZPC Patam Rangmang, ZPMs Haweli Kri (Tezu), Bikeso Tega (Sunpura), Anchal Samiti Chairperson Jamso Tindya and 14 Congress ASMs out of 16. Former Anchal Samity Chairperson, Nyame Tayang and one Sobrang Tayang also joined the party in presence of state BJP President Tapir Gao, state BJP’s organizational General Secretary Ramesh Kadaganchi, Minister Dr Mohesh Chai, and party in-charge of Lohit Kamtok Lowang. Welcoming the new members to the party fold, Gao exhorted them to work sincerely to strengthen the party organization as well the hands of Prime Minister Narendra Modi and Chief Minister Pema Khandu. The party leaders also highlighted numerous welfare schemes introduced by the BJP led central government and appealed to everyone to help those schemes reach to the door steps of the villagers. Later, the meeting adopted political and social resolutions, which were passed by the national executive council and state executive council.